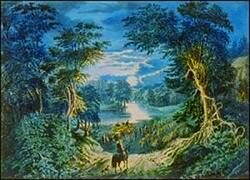 One of my favourite poems is the Highwayman by Alfred Noyes. This is a tribute with notes and details about the work. The Highwayman is a narrative poem. Written in 1906 by Alfred Noyes, it tells the story of a Highwayman, his true love, Bess and the jealous ostler who comes between them. A tragic poem "The Highwayman" is famous for its use of repetition and rhythm. It remains popular, has been translated into other forms, and is often studied in schools. Written in 1906 the Highwayman is a narrative poem by Alfred Noyes. Both romantic and tragic, its unusual use of repetition is part of its enduring appeal. 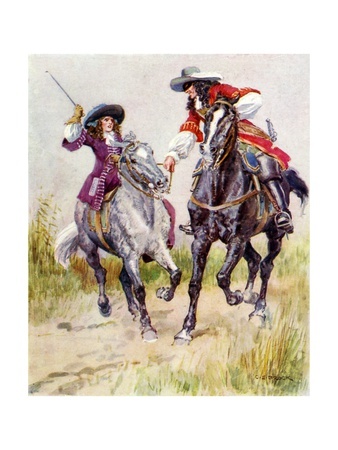 "The Highwayman" tells the story of the highwayman, his true love Bess and the man who betrays them to the King's Army with disastrous consequences. This poem is probably Alfred Noyes' best work and the one often studied in schools. There have been debates about whether it is suitable for younger children - after all, both main characters die and the highwayman is a criminal - but its atmosphere and use of language ensures that it has remained popular. Created by Poetry reconstructions, this uses a 1929 audio recording of Noyes reading his poem as the soundtrack. The highwayman was written in 1906, but still harks back to an earlier age. The references to Redcoats and King George's men dates it to some time in the seventeenth century, at the latest 1845. Much like pirates, highwayman have been romanticised by history. Although many of them dressed well, and had cash to spare courtesy of their career, they were violent, and not well respected. While the poem is fictional it is strange to think that the locals at the time this was set would have been cheering for the Redcoats who were dealing with a violent thug. Bess would have been viewed as closer to a gangster's moll than a romantic heroine. Because of its lyrical rhythm and phrasing, the poem has often been adapted to music. Unfortunately these adaptions often miss out verses or change the words to fit the music, which means that although they tell the same story they do not always remain true to their source material. Read aloud, the poem itself already has a notable meter and rhythm, and the best musical adaptions work with this. Noyes himself said that it was meant to mimic the sound of a horse's hooves. One of the most commonly available versions is Loreena McKennit's, which stays largely true to the poem with a few minor changes to fit the lyrics to music (e.g. "He did not know who stood" was changed to "He did not know she stood"). Although the Highwayman was Alfred Noyes' best known work, it was not his only poem. His later works included a short story about the Lusitania and other acclaimed works. A poem of memory about love and life. This is a poem/story about "New Love"